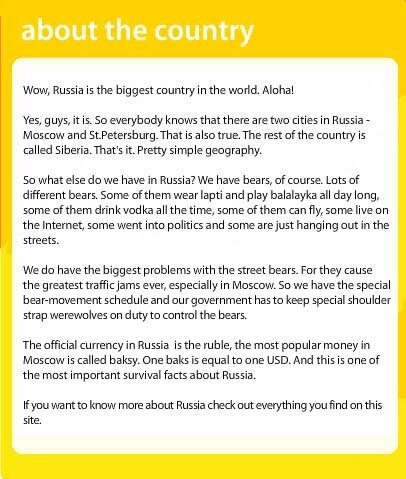 Full of information about Russia with a good sense of humor, not sure what Russians think but i'm sure we will find out !! A quote from the site about - Russian Brides !! apparantly " One of the leading Russian exports are Russian wives, Numerous organisations are working day and night to keep working the conveyor transformimg Russian brides into international housewives. A Russian wife is like a multi-fuctional home device, she can keep everything clean and organized, cooks wonderfull, has minimal system requirements and a pretty good interface"
While looking to find an upgrade for yourself, if you come across to a model smokinghotkova without a Kalashnikov ..... mouth with XP OS and not Vista, please let me know! Don't forget to check the return policy and guarantees! Site is made by Elan Marus who has the copyright!